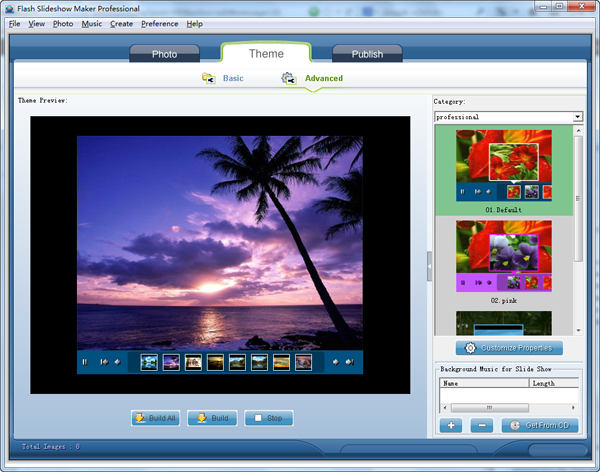 Flash Slideshow Maker enables you to create Flash galleries, photo web albums, flash banners and musical flash slideshows from pictures. To turn your pictures into a flash gallery, you do not need to know any code or professional skills. In this article, I will show you how to convert photos to SWF flash galleries with dynamic transitions, pan /zoom and theme templates. Click Photo tab, From the File Explorer area, find the photo folder and open it, then drag photos to photo area(lower part). Or you can click the Add and Add All button to import photos. After adding photos, you can rotate photos. Click the Edit button, you can edit titles, add descriptions and URL for photos. Flash Slideshow Maker can apply random transitions between photos, also you can change transitions in Transition Effect area. There are kinds of transitions for choosing. In this area, you can set time for transitions and slides according to your needs. Switch to Theme, you have Basic themes and Advanced themes for choosing. If you just want to create single SWF fills with background music, it is better to choose Basic themes. 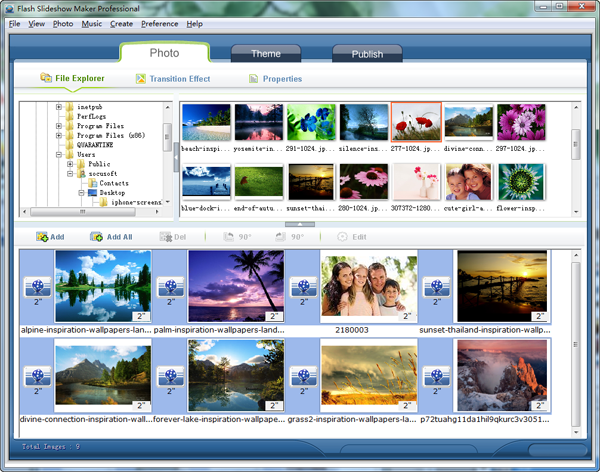 If you want to display photos on websites as a flash gallery, you should choose Advanced themes. Advanced Themes are XML driven, it will create a SWF file with HTML file and XML file. 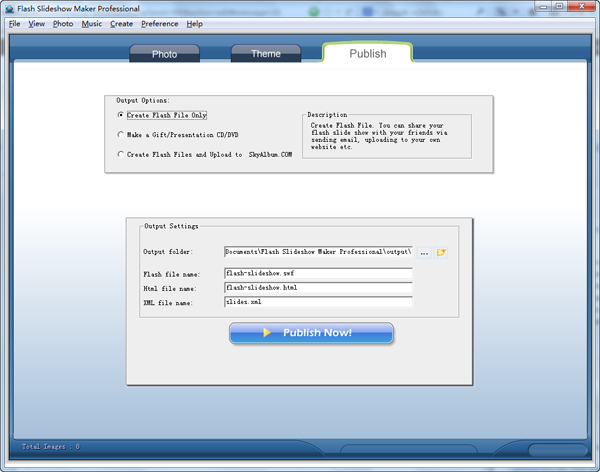 Besides a SWF flash, a HTML page and XML file will be generated. After publishing , you can share the flash with friends via email, or embed it into your websites, blogs. To insert the flash gallery into your websites, you can upload it to SkyAlbum first, then copy the embed code into your websites in Dreamweaver or into your blogs. Also you can copy the HTML code into your websites in Dreamweaver . A simple flash gallery made by Flash Slideshow Maker. This entry was posted in Flash Slideshow Maker and tagged build flash gallery, create flash slideshow from photos, create swf flash photo gallery, flash slideshow builder on March 22, 2013 by Sarah Jablich.